NASA contractor Alliant Techsystems (ATK) test fired the first stage motor for NASA's new Ares I rocket on Sept. 10. NASA?s new rocket designed to launch astronauts into orbitand eventually the moon passed a key engine test firing Thursday. The motor, the solid-fueled first stage of NASA?s new Ares Irocket, blasted hot flames and plumes of brown smoke and dust into the skywhile lying on its side during the brief static test in Promontory, Utah. NASA contractor Alliant Techsystems (ATK), which is buildingthe rocket stage, conducted the trial at around 3 p.m. EDT (1900 GMT) at its SpaceSystems facility there. The exercise was the second try to test the motor,after the first attempt was aborted due to a last-minuteanomaly on Aug. 27. 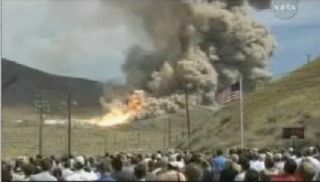 "After witnessing what we just saw, it's pretty easy tobecome speechless," said Alex Priskos, first stage manager for AresProjects at NASA's Marshall Space Flight Center in Huntsville, Ala.
"With this test, we have taken lessons learned frommany years of experience in solid rocket motor development and have built onthat foundation," he said. The motor tested today will drive the first stage of Ares I,a two-stage rocket designed to carry humans into space in the Orion crewcapsule, also in development. Orion and Ares are NASA's plan for a next-generationvehicle to replace the space shuttle after it retires in 2010 or 2011. The system, part of NASA's Constellation Program, is slatedto begin operational flight no earlier than 2015. Earlier this week, a WhiteHouse-appointed committee tasked with reviewing NASA?s future plans for humanspaceflight released a summary of its findings that stated the space agencycannot afford its current vision of returning astronauts to the moon by 2020. The committee outlined five human spaceflight options, someof which do not include the Ares I rocket, for consideration by PresidentBarack Obama. The Ares I rocket's first stage is based on the twin solidrocket boosters, also built by ATK, used to launch NASA shuttles into orbit. Theshuttles use four-segment boosters, while Ares I first stage uses a larger,five-segment motor. The segments used in Thursday?s test were all previouslyflown on space shuttle launches. The $75 million test firing lasted for about 123 seconds - thetotal time it would fire in an actual launch - giving engineers a chance tomonitor 46 design objectives through 650 instrument channels. The burn packedabout 22 million horsepower and temperatures of roughly 4,500 degreesFahrenheit (2,480 degrees Celsius) - hot enough to boil steel, and turn theUtah sand underneath it to glass. "It?s a very humbling experience when you think aboutharnessing the kind of energy we just unleashed," Charlie Precourt, vicepresident and general manager of space launch systems for ATK, said in abriefing after the test. The team said the test went according to plan, with no signsof anything unexpected. "We are confident we're going to get all the data thatwe wanted to get out of this test," Priskos said. Although the data so faris preliminary, "it's absolutely consistent with our expectations and whatwe thought we were going to get." Engineers will spend the coming days and months poring overthe extensive data generated by the firing. ATK traced theglitch that thwarted the Aug. 27 test back to a component of the groundcontroller unit, which routes power to the system that moves the motor nozzle.Engineers replaced the failed component, which apparently fixed the issue. Another significant test is looming for Ares I. On Oct. 31NASA plans to launch the AresI-X test flight to try out the rocket concept with a full first stage andsimulated second stage. Video - Back to the Moon with NASA's Constellation?